We help hospitality brands to skyrocket their customer’s experience by facilitating an end-to-end experience. Hospitality brands are putting enormous effort in delivering a remarkable, tailored customer experience within the walls of their hotels. We believe that hospitality brands should create an end-to-end hospitality experience, which continues outside the premises of their accommodation. 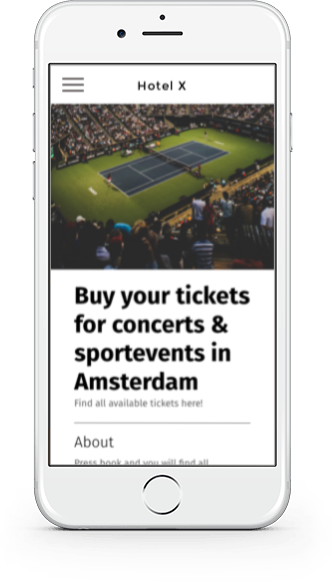 We offer a one of a kind application (and beautiful content) to create breathtaking digital city guides for your guests. These curated city guides enable guests to find hidden gems, experience the city as a local and book tickets for museums and trips through this app. Besides the city guide, our application offers you the possibility to generate up-sells, inform guests about hotel facilities and a better understand them by analyzing data. 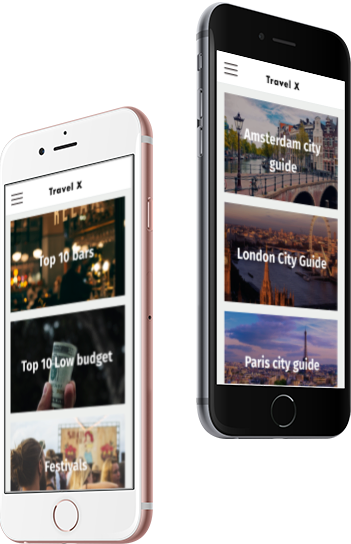 Offer your guests a curated city guide filled with all the hotspots in your city. Customized to your target audience. Generate more positive reviews by offering easy access to you Tripadvisor review page. Inform your guests about your hotel, the facilities, history and special activities. Offer your guest a “hotline” to contact the hotel for any question or request when they are roaming the city? Via phone, email or text. We know you love your hotel, and we want you to love our application. This is why we fully customize it’s feeling to that of your hotel. By analyzing the data of our application you will be able to better understand your guests and react to that. Please leave your email here if would like to receive a personal demo.